NASA reports a new island is forming in the Red Sea. About 60 kilometers (40 miles) from the coast of Yemen, an undersea eruption began in mid-December 2011. Local fishermen reported an eruption near the island of Saba, while satellites captured a white plume rising from the sea, and a pulse of sulfor dioxide. The activity was located on the northern edge of the Zubair Islands. 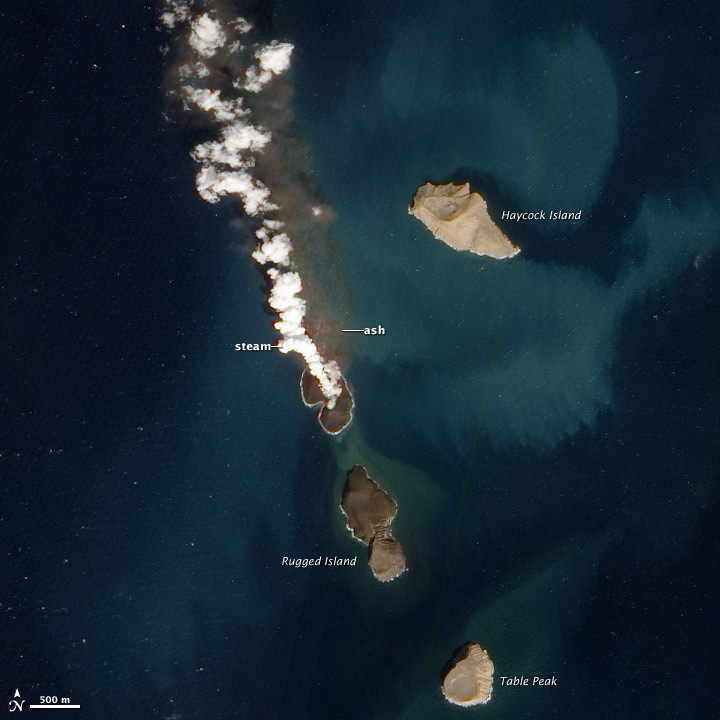 On December 23, high-resolution satellite imagery revealed details of the eruption. More recent video from a Yemeni Navy helicopter showed violent explosions, typical of shallow submarine eruptions. This new satellite image, acquired January 7, 2012, suggests that the eruption has risen nearly completely above water. A plume of steam, other volcanic gases, and ash spews from a distinct cone. The land surrounding the vent has grown, and is now about 530 by 710 meters (1,700 by 2,300 feet) across. Once above water, past eruptions in the Zubair Islands were primarily effusive, with relatively runny lava forming thin lava flows. In contrast to the fragmented rock that forms when lava interacts directly with water, lava that solidifies on land is tough, so this new island is likely to stick around. Welcome to the newest addition to our planet!